In a lot of ways, I really wonder about this permanent disaster relief idea. I really truly believe that if there was a permanent disaster relief fund, there would be pressure to find a disaster every year to use the funds that are there. They will never build up to be used in a true disaster. Yearly questionable disasters will eat it up. Have you ever seen government money that doesn't get appropriated if it is available? I haven't and this would be no exception. Is the system for disaster aid for agriculture working now? Not really but a permanent fund won't fix it. I really like this comment in the story. "Our highest priority is let's set up a permanent program," he said. 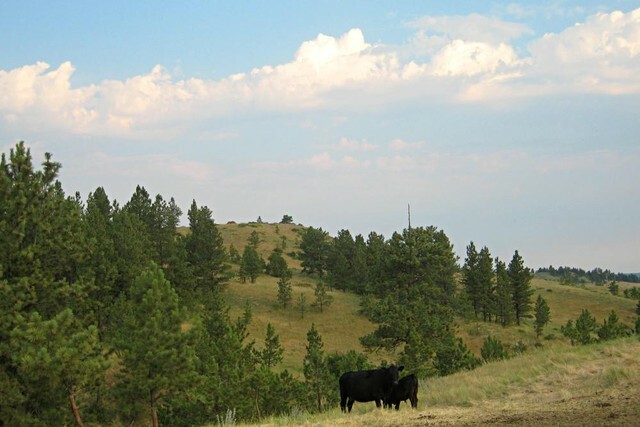 "... We would urge your support in helping America's farmers and ranchers creating a permanent program; give them a helping hand, not a handout." Isn't taking money from the government, which comes from taxpayers, a handout? It sure seems like it to me. I know they are trying to sugar coat it to get it passed in Congress and make it seem "noble" some how, but a handout is a handout. I'm not to sure calling it a "helping hand" makes anything but a semantic difference. Then I note something else in the story. The way this "fund" would work, is they would add 1 to 1.5 billion dollars every year for disaster relief. They claim it might not all be spent every year, and I have some ocean front Montana property to sell you, and the fund will build up. They then give us that "Since 1998, Congress has approved 23 ad hoc disaster bills totaling $47 billion." That works out to be almost 6 billion dollars a year in disaster aid for agriculture. So how does a fund of 1.5 billion a year cover these costs? What does Congress plan on doing if there are more disasters than their "relief bill" can fund? Maybe bring up ad hoc disaster bills just like they do today? I'm sure they will. I just don't think this is going to work out real well. A permanent disaster relief fund would just make farmers and ranchers more of a beggar as they go hat in hand to Congress, or bureaucrats, whichever control this mythical fund, every time there is a little problem that they want money for out of the "fund." Is this how we want the American public to see us, hat in hand, begging for money, cleaning out this disaster fund every year because it is there? I just don't think this is a good idea but I'm sure I'm in the minority. Most guys want this. They like begging I guess. 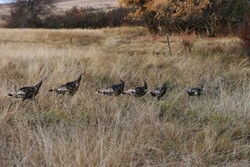 A flock of young turkeys. The older, wiser ones found a better way to hide from me. Taken 10/13/2005.